Three dandyhorse writers cracked open some bike (and bike-friendly) reads for this first installment of dandyREVIEWS -- a new series about books on biking. Eat, Sleep, Ride follows the adventures of author Paul Howard as he attempts to compete in 'the longest mountain bike race in the world'; the Tour Divide. The website describes the event as a one-stage self-supported 2,745-mile (4,418 kilometre) mountain bike race, from Banff, Alberta to Antelope Wells, New Mexico, crossing the Continental Divide 30 times over 200,000 feet of elevation (equivalent to seven times up and down Mount Everest from sea level). Paul is a quirky Englishman with a great vocabulary and a love for both flora and fauna. In spite of this love he could reasonably be described as terrified of bears and incredibly cougar shy. The title gives a lot of the story line away. It’s a race, and as it is such he does not spend a lot of time sightseeing or drinking beer, which might have made all those mountain passes slightly more palatable. His race is very much against himself. He knows from the start, that as a quirky middle-aged English man he is not in contention for top prize, but he is also deadly serious about competing properly and fair play in general, which are relatively nice qualities to have. He is a more than passable storyteller, though at times he can be a little verbose and miss parts of the big picture. You never really feel the climbs and often are unaware of the surface he is riding, while acutely informed of the surrounding flowers. All and all, worth the read but maybe not worth the money, unless you are planning to do the ride. This book covers all aspects of urban cycling. It is intended for general readers, but is backed up by plentiful research. Much of the content will not be new to long-time cycling advocates. 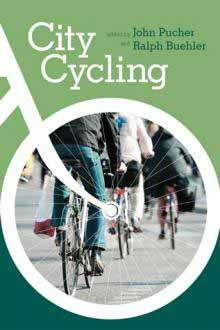 One chapter outlines all the health benefits of cycling, physical and mental. The chapter on effective speed explains how the high cost of private cars makes them surprisingly slow. Even extraordinary measures to “keep the cars moving” do not address the problem of the long hours people work to pay for them. There is a summary of the various kinds of bikes and accessories. The chapter on infrastructure contains a refutation of John Forester’s vehicular cycling theory and affirms that bike lanes are essential for bringing the benefits of mass cycling to our cities. The most interesting part of the chapter on safety cites studies that question the value of helmets. It appears that helmet users are generally more law-abiding and simply less likely to have accidents. It remains to be seen whether this will cause cyclists to abandon helmets en masse. Other chapters cover the integration of cycling with transit, bike sharing, how to encourage women and children to cycle, and promoting cycling in cities large and small. The phrase “war on cars” is not used per se but it is clearly implied in several places. For ordinary cyclists, this book will clarify many issues relating to cycling and make them proud to be cyclists. The next time you hear a motorist accuse a cyclist of “blocking traffic” or “causing problems” (whatever that means) pay no attention. Nor should cyclists have to pay for infrastructure; we make cycling facilities pay for themselves simply by using them. This is an excellent book for those who work to promote cycling and for those who simply enjoy riding bikes. It is a valuable tool in the fight for healthy, cheap, sustainable transportation and livable cities, and it will inspire more cyclists to become active in their communities. You may be thinking that this transit-focused travelogue isn’t a bike book, and if so, you are (mostly) right. But in Straphanger, named after a nickname for how people ride subways and buses, Montrealer Taras Grescoe visits a number of cities around the world and observes how people get around (or have trouble getting around). Grescoe visits New York, Los Angeles, Portland, Phoenix, and Philly; Vancouver and Toronto; as well as Shanghai, Tokyo, Moscow, Paris and Copenhagen. In many of these cities, cycling is part of the culture and part of the transit solution. In his last book, Bottomfeeder – about a quest to source out ethical seafood – Grescoe was as technical as he was passionate; in Straphanger, he’s freer and more fun, but still underpins his adventures with historical research about how each individual city evolved, and current information about culture and city planning. So what is biking doing in a transit book? Well, for one thing, Grescoe discusses how bikes can help solve the last mile problem -- i.e. even if you live in a city with a great commuter rail network and a good subway line, how do you get from the station to your home or sometimes from the station to where you work? (I'm guessing this is what those covered bike racks are for near Toronto's St Clair West Station). He also writes about the success of bike share programs around the world. Grescoe describes Copenhagen, in particular, as a kind of bicycle Utopia. Thanks to the city’s bike paths and right-of-ways, the Copenhageners he visits and meets with view cycling as a sensible, perfectly normal way to get around, and do so in their regular clothing, with their kids in tow. He speaks to cycling advocate Mikael Colville-Andersen, who shares his anti-helmet argument, and Colville-Andersen tells him that Copenhageners are weekend drivers – they take their cars out of town on trips, but don’t use them to get to work and run errands. The book transcends nitty-gritty transit geekery to address a broader question: what kind of city do we want to live in and how can we find inspiration in other cities to make it happen? 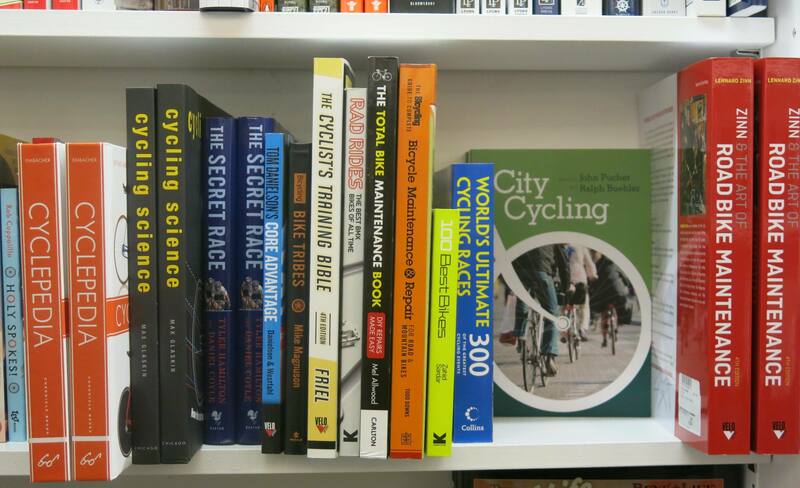 Do you have a bike-related book that you would like to review? Or perhaps a recommendation of a book that we should check out? Please email sarah@dandyhorsemagazine.com with your suggestions.